I was going to start out by saying that it is going to be an interesting next few days, but then I realized that would be a lie because tonight’s meal was very, very far from interesting. You see, Ogre is out of town and we are staying with my parents until he gets back. I still have to do childsplate, though. I don’t enjoy eating out with the kids on my own. I have trouble managing. You’d think that’d make for an interesting story. You’ll soon read that it doesn’t. 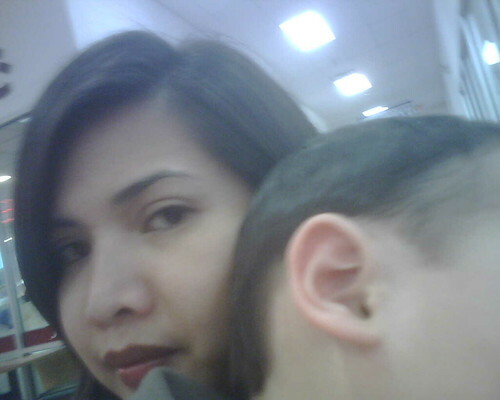 I decided that I would take Benji to get our passport photos made and then out to eat. Mina is still not feeling well. I promised her I’d bring back some Chinese BBQ (she didn’t want to eat all day.) 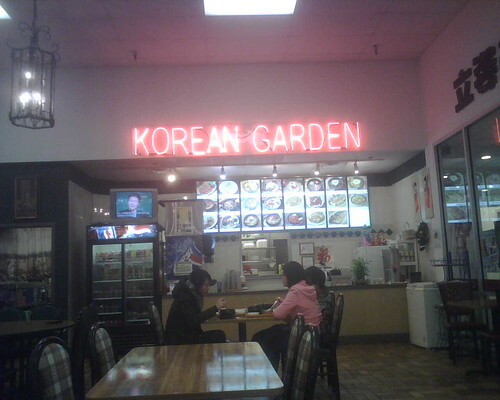 For Benji and I, we’d be heading to Korea Garden. I know that this is not one of Ogre’s favorites, so he wouldn’t be missing anything. 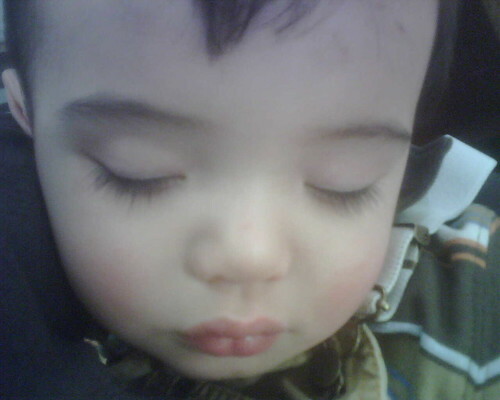 OF COURSE, Benji fell asleep on our way to the restaurant after we got the passport photos done. I pulled Benji out of his carseat and order without him waking up. I settled in to our table, pulled over a high chair, grabbed drinks out of the refrigerator (their drink machine was on the fritz) and sat back down all without waking up Benji. 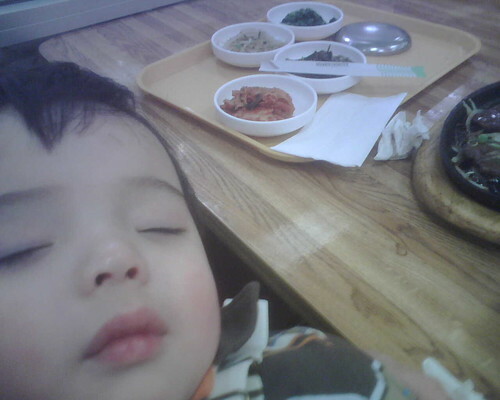 And Benji did not wake up the entire time during dinner. The people behind the counter saw me with the sleeping child and brought my food to me (normally, they call out your number and you pick it up yourself). I changed Benji’s position so I wouldn’t spill flaming hot soup on him as I tried to eat while holding a large, sleeping toddler. I ate in silence for the next 30 minutes. Yup, just me and my thoughts. So, what did I think about? I paid too much for this meal. Like, I think they overcharged me. I debated going back up to ask for a receipt and decided the hassle and possibility of waking up Benji was not worth a few dollars. This is going to be a very boring post. Sometimes bad news becomes somewhat fortuitous. Should Mina go to school tomorrow? Yeah, I paid too much. Are people going to wonder if I really ate out with Benji? I should take a picture of Benji and the food. Where am I going to eat tomorrow? Should have got the passport photos after dinner. I hope no one calls and wakes up Benji. How much was this can of coke? Maybe it was the V8 splash? People will stop reading this blog after today’s post. And that’s about it. I was happy to have my large purse to put Benji’s juice and the small to go container of food in. We stopped by Joy Luck BBQ to get Mina’s BBQ pork and guess who finally woke up??! They serve Korean restaurant standards here. It reminds Ogre of eating at the mall, because it counter service right outside the Asian supermarket and communal seating for the two restaurants that are side by side. Don’t ask me why I need two entrees for one person. 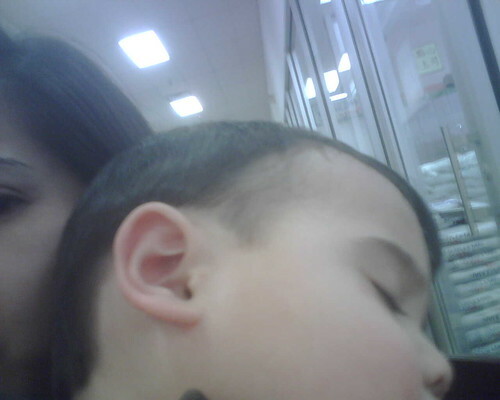 (Benji asked for rice at Walgreens so he’d be taken care of -of course he never woke up to see it). I ordered the Udon Soup. 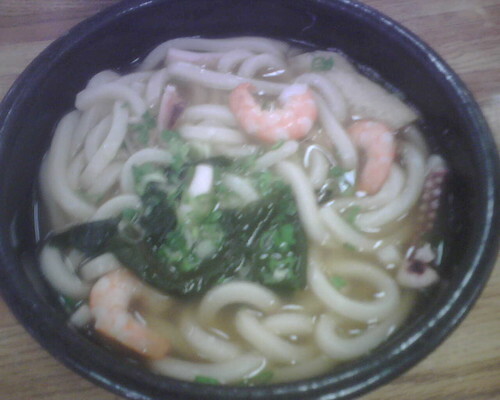 It is a seafood udon soup and I LOVE this soup. It has such a good flavor and the noodles are the perfect size and texture. It comes with very thin fishcakes, squid (I don’t actually eat that), shrimp, and clams. When I order soup, I really order soup for the broth. I love this broth, it’s got a perfect seafood/salty flavor. Admittedly, this flavor is what turns Ogre off of this soup. He does not like it at all. I don’t care, I wouldn’t share with him anyway! I also ordered the BBQ Short Ribs. These are excellent here. Nice and tender, with a good grill flavor. The marinade is sweet and goes very well with the kimchee. 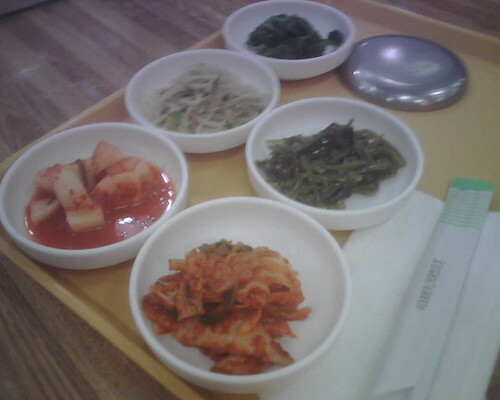 You don’t get a lot of banchan here, but what you do get is very tasty. 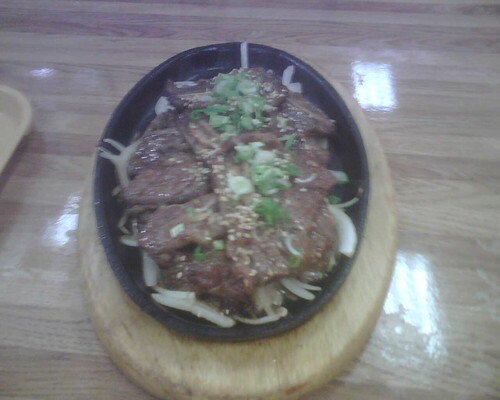 I have also had the Bulgogi here and I just think it’s just average. It was counter service, but they were kind enough to bring out my tray. I would not go so far as to say that this is a kid friendly restaurant, but they’re not un-friendly to kids. It’s the epitome of laid-back, which is a plus, but there’s no kids menu, no kids activities, and some kids may not enjoy this food (although, the BBQ short ribs is very palatable). For Korean food, it’s hit or miss, but I think the Udon and Short Ribs are really good here. You should be forewarned that the restaurant is inside the storefront but outside of the supermarket. You WILL NOT see a sign for this restaurant on the outside of the building. Look for they Muy Hua Supermarket and go in the sliding doors, turn left after the Joy Luck BBQ spot and then take a right. Seriously. The Super G Mart (Used to be Assi Market) on Spring Creek also has one of these “Food Courts.” I was less than impressed with their Korean food counter – but it is good for a quick, inexpensive meal. yes, i’ve been wanting to try that korean spot. sometimes i crave quick and easy korean food. we’ll be going there at some point. i have suggested to ogre after snickering at the supermarket name a few times, but we haven’t made it out there yet.